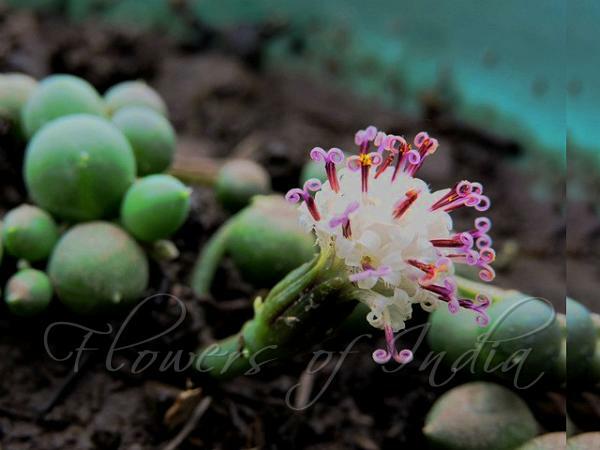 String of Pearls receives its common name from specialized leaves which are the size and shape of small peas (about ¼ inch diameter).Its trailing stems can grow 2-3 feet. There is a small tip on at the distal point of each leaf and a thin band of dark green tissue on the side known as a "window". The plant blooms during the summer and, like all asterids, it has a compound flower. The trumpet shaped flower forms clusters (about ½ inch diameter) of small white flowers with colorful stamens. The flower will last about a month and is said to smell like cinnamon and other spices. The odd shape of the leaves is an adaption to arid environments and allows for the storage of water while exposing a minimum amount of surface area per volume to the dry desert air. String of Pearls is native to the drier parts of southwest Africa.